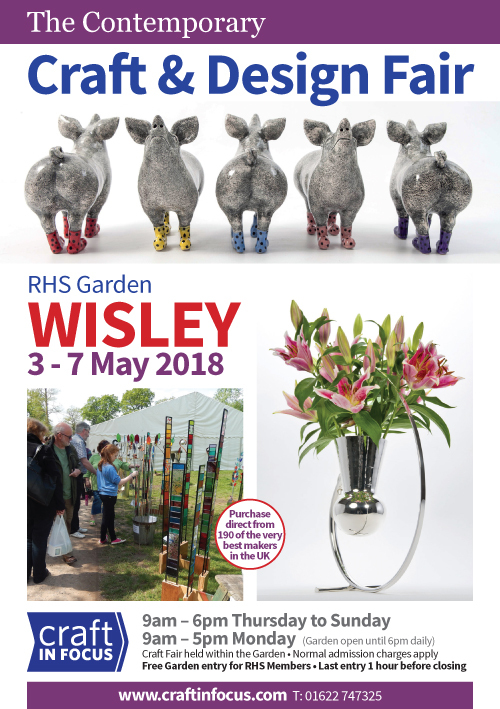 This event, one of our largest, will be held mainly in floored marquees within the beautiful surroundings of RHS Garden Wisley so visitors will be able to view and purchase contemporary craft and art whilst also enjoying the beautiful spring garden with its huge plant collection. This year, alongside the marquees displaying and selling the work of over 200 of the UK’s finest designer makers, the event will incorporate another 30 demonstrating artists, a food village and live music! In addition visitors will be able to discover a diverse range of sculptures, garden art and outdoor exhibits as they wander around the world renowned garden and up towards the state-of-the-art glasshouse where there will be a display of work by some of the UK’s finest contemporary silversmiths. Come and see our new designs and colours for 2018.